2012 has been a remarkable year for Raincoast; probably the most productive we have ever had. With your support, our accomplishments this year have ranged from securing our second commercial hunting license to establishing a conservation science lab at the University of Victoria. The majority of our efforts in 2012, however, have been focused on the biggest challenge we have faced yet – stopping the conversion of BC’s coast to an energy corridor for the shipment of tar sands oil. Raincoast is using art andscience to thwart these ill-conceived oil projects. On the science (and legal) front, we are utilizing our scientific expertise and submitted evidence to the Northern Gateway Joint Review Panel (JRP) to expose Enbridge’s flawed risk assessment. We recently learned that our role as intervenors in the Northern Gateway review process will continue for many months beyond the original timeline. Simultaneous to our work at the Northern Gateway JRP, we are building a groundswell of voices outside the review process demanding an end to a Big Oil agenda that would undermine our ecological heritage and future sustainability. With that goal, and the support of over 50 west coast artists plus an army of incredibly dedicated volunteers, Raincoast launched Art for an Oil-Free Coast.This staggering effort included an artists expedition to the proposed tanker route, a 160-page hard cover book, an eBook, a documentary film, and a 63-piece touring exhibit of stunning original art – all within six months. More remarkably, the artists have donated their works to support Raincoast’s efforts to stop Northern Gateway.Check out the online auction of these beautiful works of art here. Our job now is to take this show and its message beyond BC to the oil field cities of Calgary and Edmonton, then across the country to Toronto and Ottawa. This is a critical moment for our coast. Public opposition to the Enbridge pipeline in BC is at its highest level ever, but the deal is not dead and the coast not yet safe. We need to be heard across the country. This is not a time to quietly let our guard down – it is our chance to push harder, faster, and louder – across the province, across the country, and internationally, to ensure the magnificent BC coast is protected from this impending threat. 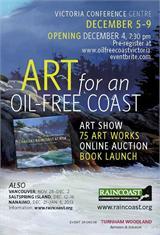 BOOKS AVAILABLE Art for an Oil-Free Coast is now available as a free Book for iPad on iTunes. Want the hard copy book? They are $45 and selling out fast. Order here. Over 60 pieces of original art can bee seen at the exhibitions. Watch the film, get the book, view the art and bid on your favorite. Raincoast’s sponsors are as dedicated to an oil-free coast as we are. Thank you to our Art Exhibition sponsors! We couldn’t do ths work without them. Forward this newsletter to a Friend | Visit our website | Click here to unsubscribe.